This site contains a video tutorial with notes on perimeter and area. 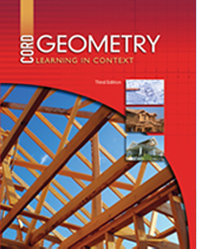 This page includes several links to discussion and practice of areas and perimeters for the polygons covered in this chapter. This page gives the formulas for finding perimeter and area of rectangles and squares. This page explains and providers practice for finding the perimeter and area of rectangles and squares. This site shows how to find the area of a parallelogram. This page interactively demonstrates the formulas for finding the perimeter and area of trapezoids. This page contains practice problems on finding the perimeter and area of trapezoids. This site explains how to find the perimeter and area of regular polygons. This page discusses the perimeters and area of regular polygons. This page gives the formulas for finding perimeter and area of a circle. This page contains a calculator that finds the perimeter and area of a circle by stating the radius. This page contains a gizmo about perimeter and area of similar figures. This site includes links to several different spinners, and a tool to measure for the purpose of calculating geometric probabilities to compare with experimental results. This site includes activities relating geometry, area, and probability.